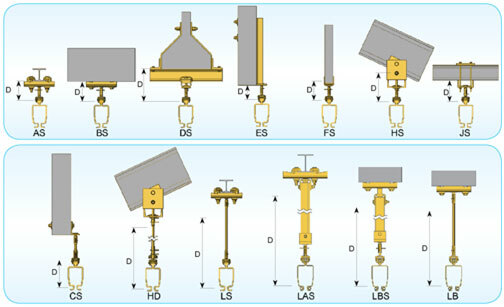 H-Style Crane Range: Capacities from 80kg up to 2000kg with unlimited fixed rail length & Bridge Spans up to 8 meters. Lifting Devices: Light Crane Systems can be fitted with Manual, Electric or Pneumatic Hoists, Load Balancers, Vacuum Lifters & Various types of Clamps & Grabs. Light Crane Systems are used in a lot of industries. e.g. in the Woodworking or Joinery trade, we fit Vacuum Lifters to the Cranes for lifting & handling Doors, Windows & Sheets of MDF, Plywood & Chipboard etc. In the Steel Fabrication trade we also fit light crane systems with vacuum grippers for handling various types of sheet metal of all dimensions & surface finishes. In the Food, Pharmaceutical & Chemical industries we would install either aluminium light crane systems or stainless steel light cranes systems fitted with electric chain hoists, pneumatic chain hoists, vacuum lifters or load balancers for handling drums, sacks, reels, cartons & boxes. Our Light Crane System is based on three optimised steel profiles. Profiles 125, 200 and 260 cover load range up to 2000 kg. The best weight carrying capacity ratio in the word ensures maximised suspension distances. This leads to true savings due to less steel supporting construction, number of suspension components and installation time. Our Light Crane System is durable due to its closed profile construction which prevents the system from being exposed to dust. Profiles are surface treated with impact resistant powder coating. Standard profiles are delivered in full 1-8 meters in colour yellow RAL 1007. Other colours and surface treatments are available on request. All connections in the system are bolt connections which make the system easy to install and adapt to changing layout needs. Patented trolley is nearly silent with a rolling resistance only approx. 1% of the moved load. 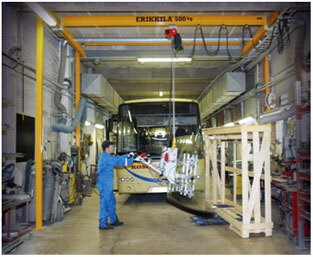 Our Light Crane System brings ergonomic and quality for the working environment. Single and Double Girder Crane is a user friendly personal work station crane. Its coverage is extensive and swinging of the load is minimized as the loaded push trolley centralises itself automatically to the right lifting position. Single girder crane is the most ergonomic solution due to its three dimensional construction and light own weight. With a double girder crane the load capacity is doubled and lifting height increased as the hoist is suspended from a hoist saddle located between the bridge profiles. Single and double girder cranes can be suspended from roof construction with standard suspensions or mounted on the floor with freestanding support frames. 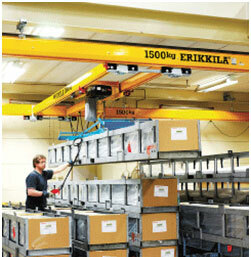 • Original ERIKKILA –innovation for super low headroom! Single or double girder crane with a raised construction is the right choice when the lifting height has to be maximised. Raised construction is designed for locations with limited headroom where standard construction would not bring the required lifting height. The bridge profiles of raised construction are raised between the tracks profiles to increase lifting height. A system with a raised bridge can be suspended from existing ceiling construction or from Freestanding support frames. Light Crane System includes various different types of articulating standard suspensions to mount the crane to the ceiling construction. The articulation ensures for its part the light and ergonomic usage of the system.